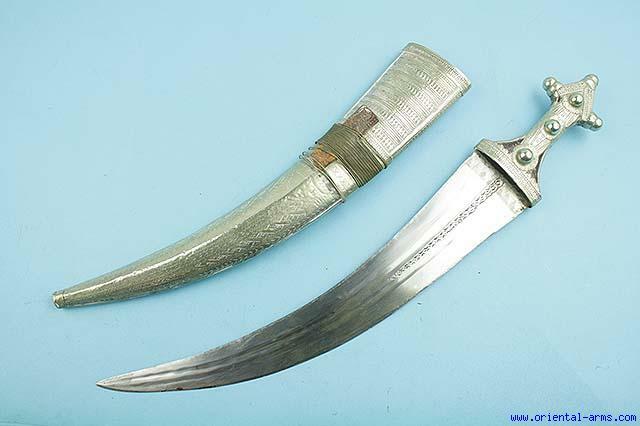 This long Dagger / Short sword represent a class of Arab jambiya�s of its own. The long curved blade and the strong �I� shaped grip is characteristic to this class, which was the favored side arm of the Wahabite Arabs. In the 19 and later the 20 Century however, it is spread all over the Arabian Peninsula mainly in the Central and West regions of Najd and the Hejaz. The blade is deeply curved with two central fullers 15 1/2 inches long. The grips are dark wood riveted to the steel tang with three big rivets, and the front face of the hilt is covered with white metal cover. The scabbard is wood in iron cover the locket (scabbard mouth) and the chape (scabbard tip) is made of white metal. Very good condition. Simple and not flashy sword but all parts are authentic and original, probably from the first half of the 20th Century, around the 50�s. Total length 20 1/2 inches.